What is Sriracha Hot Sauce? What is sriracha? Pronounced seer-RAH-shah, it is a hot chili sauce named for the coastal port city in Thailand from which it hails. It is also known as rooster sauce because the California-made Huy Fong brand features a rooster on the bottle.The general recipe for sriracha includes ground chiles, vinegar, garlic, sugar, and salt, and was first developed to serve with seafood. In the US, the Huy Fong brand is the best-known sriracha chili sauce or hot sauce available. The company is based in Irwindale, CA. 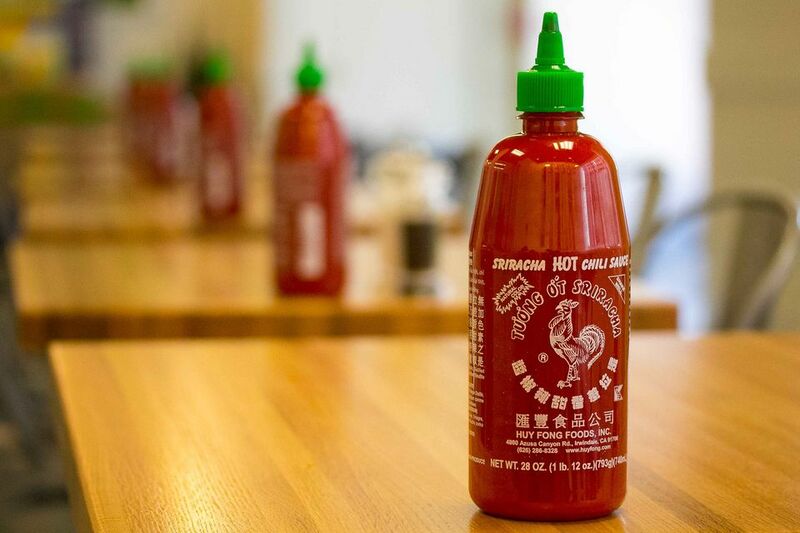 Sriracha is likened in flavor to chili paste, but with much more heat. The Huy Fong take on Thai sriracha is thicker and less sweet than a typical Thai sriracha, but it makes an excellent multi-purpose condiment that the world over, especially Americans, has embraced. Sriracha is used just most hot sauces are used: to add some spiciness to otherwise mild dishes. It is usually used just before food is served. Serve sriracha with fresh fish or seafood, grilled meats, or tofu dishes. Dot sriracha onto pureed soups for a hit of color and heat. Serve sriracha alongside omelets or egg dishes. Add a dash of sriracha to Bloody Marys and other cocktails. Whisk sriracha into vinaigrettes or marinades. Stir sriracha into mayonnaise or aioli to make a spicy sandwich spread. Use sriracha to spice up rice and beans. Serve sriracha as a condiment with cheese. Mix sriracha into dipping sauces. Serve sriracha with slices of ripe mango. Serve sriracha with fries or roasted potatoes. Use sriracha as a deli or barbecue condiment. Most grocery stores will carry Huy Fong Foods' Sriracha sauce. Their other two products, chili garlic, and sambal oelek are also sold. Aficionados can also buy Huy Fong's sriracha by the case (12 17-ounce bottles).